HARRISBURG – On Wednesday, Rep. Ryan Mackenzie (R-Berks/Lehigh) and a Holstein named “Heart” won first place during the 2016 Pennsylvania Farm Show Dairy Showmanship Contest. This marks Mackenzie’s third year participating in the event and his first win. 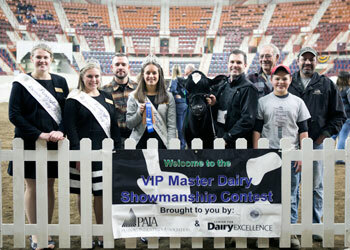 The Dairy Showmanship Contest is presented annually by the Pennsylvania Department of Agriculture to raise awareness of the importance of the dairy industry to the state’s economy. Agriculture is Pennsylvania’s largest industry, and dairy production is its largest sector. During the contest, legislators and other state officials are teamed with individuals, often young people in 4-H, who regularly show dairy cattle. The experienced handlers train the state officials on proper form, technique and information judges desire to know about the cattle being shown. Mackenzie’s training handler was 12-year-old Tanner Davis, the son of Michael and Angela Davis of Leesport. Tanner and his two sisters, Mikayla and Alexa, are all actively involved in 4-H and youth agricultural programs. They keep their animals, including Heart, on their aunt and uncle’s farm in Bern Township.